Industrial Stormwater Treatment Systems - Fullerton, Santa Ana, Anaheim | Pure Effect, Inc. Pure Effect manufactures, rents and sells industrial stormwater treatment equipment designed to meet your site specific discharge limits. With the new permit requirement going into effect in 2015, industrial facilities are now required to improve their BMP's if they do not want to become a Risk Level II facility. This may require the installation of an advanced treatment system, as the discharge limits for some of the contaminants are in the parts-per-billion range. The Industrial storm water treatment requirements can be quite challenging; there are several critical discharge limitations that have low discharge limits including heavy metals [Lead, Copper, Zinc etc.] conventional metals [Iron, Aluminum etc.] Chemical/ Biochemical Oxygen Demand and other organic/inorganic constituents. The rain-stormwater treatment system must perform to control these contaminants dependably and efficiently. That is the benefit of working with Pure Effect, Inc. – we are the “Solutions Partners” for your storm water requirements! Need equipment in a hurry? 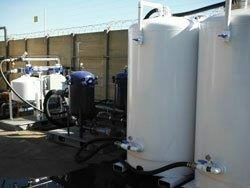 Pure Effect rents complete industrial stormwater treatment equipment that can be mobilized as early as one week. This will allow your facility to stay compliant and return the system when rainy season is over. It also keeps the upfront expenditures to a minimum. Contact Pure Effect for additional details on our rental program. Since your stormwater is constantly changing, your treatment equipment should be able to change as well. One of the many advantages of working with Pure Effect is we offer modular equipment design. This will allow your facility to add or remove equipment as needed in a short period of time. It also allows the equipment to be moved if your facility layout changes. Another advantage of utilizing modular designed equipment is that it allows the facility to start with a basic treatment system as needed. Even though this approach may not meet all of the discharge limits on Day 1, it will minimize upfront capital and spread the treatment costs over time. To discuss your stormwater treatment needs and options to bring your site to compliance.